Marie: I am finally getting back to you about the milkweed in the Garden. It is indeed an annual, tropical milkweed: Aesclepias curassavica. I have not done extensive research, but have not found any connection between this species and late pupation. 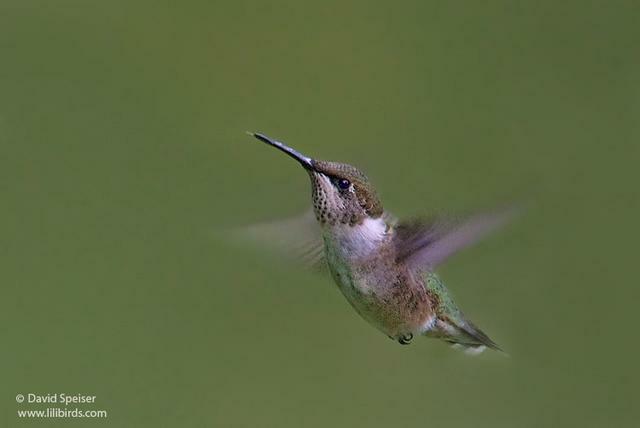 Thought you would also like to know that I had a hummingbird in back of the 79th Street Yard on Wed. morning. Way too late! It was looking for nectar in the few blossoms that the overly-warm November temps had coaxed out. I just hope it took off for parts south before the cold wave hit. 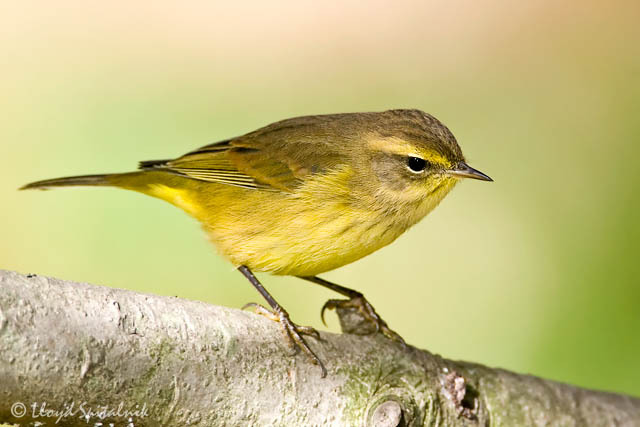 ...A Prairie Warbler as well as a Palm Warbler continued near the Pool, first on the south side of the Great Hill and then the Prairie flew over to the south shoreline of the Pool itself where after some searching I re-found it west of the waterfall. The Palm Warbler seemed to stay in position on the hill. Not all that far away in the northern end of the park, but close to the Lasker skating rink, which is at the SW corner of the Meer, a very obliging Orange-crowned Warbler showed, at first near the rink, but then moving across the Drive to just south of the rink, or about 100 feet, perhaps less, east of the eastern end of the Loch where it flows beneath the park drive. It seemed to be of the eastern race, not as bright as some western Orange-crowneds can be. I was not able to find any warblers in the Ramble ...but did see a number of birds moving around on the slopes in conifers of Cedar Hill, including both species of Kinglet, Brown Creeper, numerous Slate-colored Juncos, & some others. There also were a few Golden, & at least one Ruby-crowned Kinglet[s] in the north end of the park. A look around the SE portion of the park yielded little other than thousands of visiting tourists but there was a Hermit Thrush near the Pond. The reservoir had a decent collection of ducks and other waterbirds, including 2 Pied-billed Grebes, at least 22 American Coots,a female Green-winged Teal, 50+ N. Shovelers, 45+ Gadwall, 5+ Hooded Mergansers, and 40+ Ruddy Ducks, plus a few Bufflehead, the latter species also in modest numbers at the Pool and on the Meer. At least one pair of Wood Ducks were on the Lake and a female was at the Pond, semi-hiding at the time I spotted her. Gulls sorted through on the reservoir appeared to be of the 3 most regularly-seen spp. When trying to identify the bat that I reported, I chanced upon your commentary in the New York Times regarding Central Park bats. I ended up getting some email responses from birders who also watch for bats, and the consensus is that I probably saw a red bat, since it is the one most likely to hunt during the day. 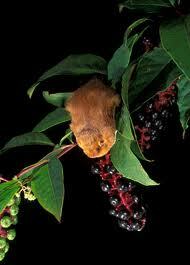 I did notice a hint of red in its fur, and the size corresponds well so that is what I am now thinking it was. I understand from your article and elsewhere that bats are common in the Park, but this is the first one I have seen in the last year, so for me it was a fun sighting! I’m curious to learn what species of bats you observe at Central Park, and how many. Here in Olympia, Wash., the large lake in the center of the city has summer visitors of more than 3,000 bats a night; many of these are pregnant, then nursing, female little brown and Yuma bats. 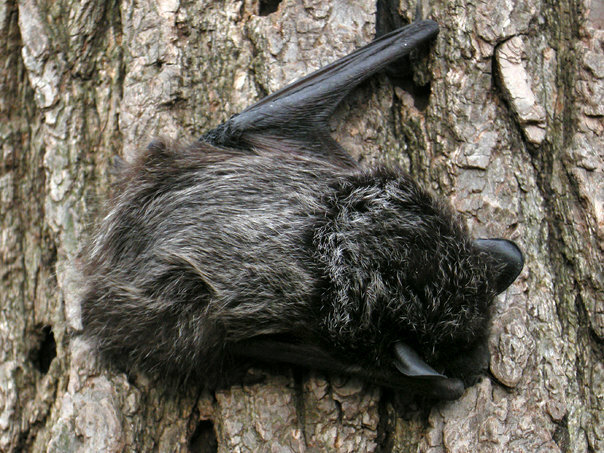 We don’t really know how many bats show up in Central Park — nobody’s ever done a bat count. But here are the five species that have been sighted in the park so far: big brown bat (Eptesicus fuscus); little brown bat (Myotis lucifugus); eastern red bat (Lasiurus borealis); northern long-eared bat (Myotis septentrionalis); silver-haired bat (Lasionycteris noctivagans). The time to find bats in Central Park, as everywhere else, is a little after sunset, when light is failing but you can still easily make out shapes. You can see our only flying mammals swooping over the shores of the lake, or Turtle Pond, or any of the other bodies of water on most summer evenings, but you have to have an eye for them. Most passers-by unfamiliar with the odd pattern of bat flight simply think they are birds and don’t give them another look. Of course a bat detector can be helpful in finding bats in other places throughout the park. In the Ramble and other woodlands you can often find bats hunting around the decorative street lamps dotting the pathways. The light attracts moths, and the moths attract bats. Yum. The metal wildlife band now stuck on Violet the red-tailed hawk’s swollen leg has almost undoubtedly been on her leg for more than four years, presumably without problems for most of that time. The band, if it is the one wildlife officials think it is, was put on Violet on Oct. 3, 2006, her hatchling year, in New Jersey near the Delaware Water Gap as part of an ongoing study of hawk migration patterns. That band is a size 7B, the correct size for red-tailed hawks. Violet does not appear to have been documented again by humans again until October 2010, when the wildlife photographer and Pale Male chronicler Lincoln Karimphotographed a hawk in Washington Square Park with a swollen leg and a band jammed in the same position, halfway up her shin. It is widely believed to be Violet. In December, Mr. Karim brought the hawk to the attention of the head of the federal Bird Banding Laboratory, Bruce Peterjohn, who, after some prodding from Mr. Karim, asked the Long Island-based raptor rehabilitator Robert Horvath to capture the bird and remove the band. The data about the band emerged when a medical rescue team led by the state paid a visit to Violet on May 12, a few days after Mr. Horvath’s visit. The rescuers, who decided not to capture Violet for now, were able to read the last five digits of the nine-digit band number and reported them to the Bird Banding Lab. While there is a very remote possibility that there is another size 7B band with the same last five digits on another bird, the band is overwhelmingly likely to be No. 1177-60335, Mr. Peterjohn said. That band was placed by a bander at Stillwater, N.J., on a first-year hawk as part of a 40-year study of migrating hawks along the Kittatinny Ridge in western New Jersey overseen by Giselle Chazotte Smisko, a wildlife rehabilitator with a master bird-banding permit who directs theAvian Wildlife Center in Wantage, N.J. The study has revealed, among other things, a reduction in fall red-tailed hawk migration that is probably linked not to a drop in the number of hawks but to climate change, Ms. Chazotte-Smisko said. Ms. Chazotte-Smisko said that the band in question was fitted by a bander with more than 20 years’ experience who has since developed medical problems and is unavailable to be interviewed. Experts, including Dr. Elizabeth Bunting, the wildlife veterinarian who observed Violet up close on May 12, have speculated that Violet may have sustained an injury in the last year or so, such as a bite from a squirrel or other prey, and that the swelling in her leg from that injury pushed the band up from her ankle to her shin, where it is now lodged. The sedentary period Violet went through when she was sitting on her eggs is likely to have made the swelling worse, Dr. Bunting said. Update, 3:41 p.m. |Currently, Dr. Bunting said, Violet appears to have good circulation in her leg — despite the swelling, there is some space around the band. The swelling could be due to scar tissue or fluid retention, neither of which is life-threatening, and it is not clear what role the band is playing in the injury, she said. anchor her food while her right leg dangles uselessly behind her. Violet, mother of Pip, is now in danger of losing the banded leg that had plagued her even before the Hawk Cam started rolling on the 12th-floor window of New York University’s Bobst Library. A video of Violet in Washington Square Park shot on Saturday by Lincoln Karim, the wildlife photographer and Pale Male chronicler, shows Violet’s right leg dangling uselessly below the metal wildlife band on her shin, the foot gray and scaly from lack of blood flow. There also appears to be a broken bone protruding above the band. After watching the footage, Dr. Elizabeth Bunting, a veterinarian specializing in wildlife at the Cornell College of Veterinary Medicine who has observed Violet for several months, was not hopeful about the prospects for Violet’s leg — or her survival. Without a hands-on medical assessment of her nerve function, the severity of the fracture and the circulation to her toes, it is hard to determine the prognosis for the leg, she said. She was seen hobbling around the nest in May shortly after her hatchling, Pip, emerged, with her right leg tangled in what appeared to be fishing line and swollen to about three times its normal size. The metal wildlife band wedged on her shin appeared to be making the situation worse. A panel of experts and officials from the state Department of Environmental Conservation and Protection, including Dr. Bunting, were called in to assess Violet from close range. But they ultimately decided not to intervene, and left the nest, where Violet was feeding a week-old baby, alone. Even as some called for the band to be removed, wildlife officials said it was not clear that the band, placed on Violet’s leg in 2006, was the cause of her injury at the time. The department stuck by its decision on Monday. “Based on direct observations of her condition at that time, the consensus opinion, particularly given the need for Violet to continue to care for her young, was to avoid additional harm that could be caused by an attempted capture,” Michael Bopp, a spokesman for the D.E.C., said in an e-mail. Dr. Bunting said it was possible that a subsequent trauma — like a run-in with a car or another animal — had hastened the worsening of the foot. Now the question, once again, is whether or not to intervene. Even if Violet is successfully trapped, which could take days, she would possibly face surgery and a long road to recovery. If the leg is not viable, Violet would be euthanized (amputating the leg and keeping her in captivity is not seen as a humane option). Even if Violet is able to survive the winter, it is unclear whether she would be fit for motherhood with her handicap. “There is a high probability that Violet could not stand and support copulation with Bobby,” the Ohio raptor expert John Blakeman wrote in an e-mail after viewing the video, referring to Violet’s mate. “It may be impossible to form viable eggs this year.” And if an egg were to hatch, Mr. Blakeman wrote, Violet would have tremendous difficulty feeding her young. Although Violet is capable of feeding and otherwise appears to be in good health, she has to put on a brave face to avoid becoming prey herself, Dr. Bunting said. “They are incredibly tough customers,” said Dr. Bunting who said she was constantly surprised by the resilience of these creatures. For now, Violet is hanging in there. But we don’t know for how long. S from MWP: lincoln_karim@msn.comSubject: Re: Red Tail Hawk with bad band. Washington Square female hawk with her completely crippled leg on Saturday 11/26/11. Many people are currently concerned about a female Red-tailed Hawk that made headlines last year. Violet, as she came to be called , is as one of a pair that attracted much media attention by nesting on a New York University Building looking out on Washington Square Park. . 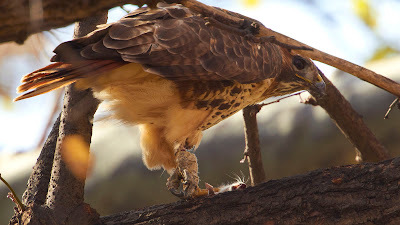 In recent weeks photographer Lincoln Karim has become concerned about the condition of Violet's left leg, the one that is banded, and was already banded when the hawk was first observed last year. That band was placed by a bander at Stillwater, N.J., on a first-year hawk as part of a 40-year study of migrating hawks along the Kittatinny Ridge in western New Jersey overseen by Giselle Chazotte Smisko, a wildlife rehabilitator with a master bird-banding permit who directs the Avian Wildlife Center in Wantage, N.J.
Update, 3:41 p.m. | Currently, Dr. Bunting said, Violet appears to have good circulation in her leg — despite the swelling, there is some space around the band. The swelling could be due to scar tissue or fluid retention, neither of which is life-threatening, and it is not clear what role the band is playing in the injury, she said.